Now to start the move Northwards, my work here apparently finished. But at the Bombay station there seems to be little chance of getting on the Rajdhani Express to Delhi — unless there are last minute reservation cancellations. I had arrived at the station in good time to beg my case; it looks hopeless. I wait two hours until the train pulls out, only to find that the night train is also full and that also has a waiting list for cancellations. The official tells me to try again in three hours. I leave my luggage in the baggage room and keep the small case with the recorder and camera. Stations all over the world are frenetic places; I look for a bookshop as I would like to buy Nisargadatta Maharaj’s book: I am That. Nisargadatta was on my list for an Interview here in Bombay, but everyone has been telling me he’s too ill to see anybody. I ask a taxi-driver for the nearest bookshop; he says there’s one in Grant Road, five minutes away. Grant Road? I look through my address book — Yes — this is near Nisargadatta’s place! What can I lose as I have so much time to spare? As I arrive, someone is running down the dilapidated stairway — this isn’t one of the better parts of Bombay. Yes, yes — Maharaj is up there, he tells me, go straight in. I find a small gathering at the feet of a simply clad very ill-looking man of about 80. The room is tiny but I manage to sit down on the floor. Nisargadatta is an Advaita Master who has a small but devoted following. He is looking hard at me but appears to be in too much pain to speak. The man I met on the stairs comes rushing back saying: My wife says it’s all right to take the extra dose. This is brought; within a few minutes the pain seems to have receded. Nisargadatta keeps looking at me, and then through an interpreter — he speaks no English — asks why I have come. Why have I come? I say: For your darshan. More silence. He asks why. I now explain that I had wanted to take an Interview from one of his Western followers but am now on my way to Delhi. He says: Jean Dunn will give the Interview. There is some confusion, she isn’t here – not until tomorrow. I begin to understand why I can’t get out of Bombay. I will have to stay – must stay for this Interview. Maharaj is brighter now and says: Ask a question! I reply: In front of the saints one can only ask for grace. This doesn’t impress him. He lets it pass. There is no other talk. We bow and disperse down the staircase. The man I met as I arrived speaks to me. He says: If you have nowhere to stay the night you are welcome to a room at my place. In the taxi he explains it is his first visit to Nisargadatta, his wife is a devotee. I am so moved; here I am being looked after by a stranger. By the time we reach his apartment I learn he is the cousin of my landlord in Rajpur where I lived for six years, and his wife is a doctor and it was she who had advised by phone the extra dose of whatever Nisargadatta takes to relieve his pain. But even more extraordinary, he explains that he is the chief engineer of Western Railways here in Bombay, which means, he assures me, he can get me a reservation on any train to Delhi! We talk late into the early hours about the life of the spirit; he wants to hear about my travels, about the gurus I have met, about my own guru. Here is a wonderful example of a devotee living in the world, carrying out his worldly duties, but with his inner attention fixed. I have met many such persons in India. In the West, as we would take up a hobby and pursue it with passion, here there are enthusiasts who give all their spare time to developing the inner spiritual life. In the morning I am taken to Nisargadatta’s minute house; I am to pick up my reservation on the night train at Mr. Malik’s office at the station later. Upstairs there is the same small gathering, but now Jean Dunn is present. Do you think — he yells — that you will succeed where others have failed? I say the outcome is not in my hands. He makes dramatic, hostile gestures with his arms. He wants me to ask questions. I repeat what I said yesterday…one can only ask for Grace. There is more yelling. His disciples laugh. I keep silence but am extremely surprised, uncomfortable. The power — I reply — that brought me here yesterday appears to be turning me away this morning. He is now laughing at me. Someone then asks Nisargadatta a question. He replies. I am hoping the provocation-scene has passed and I am spared more embarrassment. What did you make of the answer? I have been thrown into the most unexpected of situations. What can I make of anything now? I reply: My intellect is telling me that what you have said must be right, but as I haven’t attained enlightenment it is still a concept. I am begining to think it is probably far better to be shouted at by an enlightened person than to be ignored by him. He manages a quarter smile, waves his hand, we all rise, bow and struggle down the narrow staircase. I am desperately trying to disappear, evaporate as quickly as possible. I am physically very very tired…this is not the perfect time to have to cope with Sufi-Zen situations. We’ll go round the corner, I know a quiet restaurant where we can do the Interview (she must be - MUST BE - joking!). No, no, he wants us to do it — it’s only his way, just follow me! Only his way? I still can’t believe what is happening. I need time to reflect on what has just taken place, probably of more significance than I am able to even begin to understand at this moment. But we are indeed now sitting in a quiet restaurant where the interviewee has seen fit to take over; she has ordered coffee, and is poised bright and ready to start. I breathe deeply, unpack the little black case I have been holding onto since yesterday like an unmasked conspirator cornered awaiting the coup-de-grace. I am just a normal person of 59 who has been searching all her life, until ten years ago, when she heard of Ramana Maharshi. She visited his Ashram, went back to the States, then returned to India where she has been living for the past four years. Two years ago she met Nisargadatta Maharaj, and he became her guru. At Ramana Maharshi’s Ashram many people come to see him — there seems to be a tie. Is it because of the similarity of self-enquiry? It’s no longer that. Maharaj has had cancer of the throat for the past year, so his teachings have been polished; he is now saying he is no longer the consciousness, he observes the consciousness – he’s the Asolute. His teachings are now on that line. Can you tell me something about his book: I am That? It’s in the form of questions and answers. The fifth edition is just coming out. It came out in two volumes in 1973 having been collected and edited by Maurice Frydman who in late life became a disciple of Maharaj. There has been no further book published. Last year I asked Maharaj — I had been recording all his question and answer periods — if he wanted me to put them together for a book. He said yes. So Seeds of Consciousness will come out this year. Another volume will appear later: Beyond Consciousness. He is in much pain at times but manages to talk twice a day. He is one of the hidden saints so he only draws a few people at a time. His teachings aren’t for the general public — we are blessed to listen to him. He himself arranged yesterday for you to give this Interview. Can you say why he was so rough with me just now? No, I can’t. No one can give a reason for what he does. Up until his illness it was by questions and answers. Now he will no longer teach the ABCs — he doesn’t have the physical strength — he tells us the position, then it’s up to us. He wants questions to come out, then there will be silence so that remaining questions will be answered within yourself. His following is mainly Western by what I saw. Westerners are in predominance — thousands have seen him; some for a few days, some stay months. Some he makes leave at once. He says he doesn’t know why he sends people away although they want to stay. Yes, I have a residency permit. I have finished work on the second book: the work is complete… everything he has to say has been said. My aim in life is to lose an aim in life — that’s his teaching: there’s no purpose to this life, it’s just entertainment. That’s all. Many of Krishnamurti’s followers come here — ten came recently. You will find that in the first part of I am That. I can tell you this: the first time he met his guru — his friend insisted on taking him and even had to buy the garland to present to the guru — he never wanted to go. He was in his thirties. The bidi shop at the corner belongs to him: his son runs it. He had eight shops, but when his guru died he left everything, his family and business. He wandered for months all over India until he met a fellow disciple who convinced him it was better to live in the world. He returned to Bombay but all the shops had gone except this one. He didn’t want anything; all worldly ambition had gone. When people started coming to him, he built that upstairs room. Oh, about 9 by 12. I’ve seen that room very crowded, mostly by Westerners. He says Indians are not ready for his teachings. That’s correct. I feel sure that was the idea. He doesn’t want disciples — if they come, it’s fine; if not, that’s also fine. He gains nothing. He has reached the peak because he isn’t enamored of anything the world can offer. He talks about the self-styled gurus who propagate their own concepts. As far as I know, J. Krishnamurti. In the past Ramana Maharshi. The other day he said: Krishnamurti, Ramana and myself are one. Whatever comes naturally to each person he should do. No. As long as you think you are a person and this world is real, then you live by certain rules. Once you understand the complete thing, your life lives itself…there are no rules, no good, no bad: I should do this, I shouldn’t do that. If you think about it, all this is taking place in this life span, in this span of consciousness, and when this consciousness goes, what difference does it make? This comes naturally. The main and only thing he teaches is to find out who you are. The closer you come to this, the more detached you become from the world; that will happen naturally. You can’t do anything to make that happen. This idea of doing something is an ego idea: “I” can accomplish. Maharaj says the consciousness drags you there by the ear because it wants to know about itself, your true nature. For him it will be a great festival — he’s looking forward to it. For those thinking they are the body it will be a traumatic experience. For an enlightened person it’s a joyous time. When he gives you meditation does he ask what you see inside? There has to be somebody to see something (laughter)… No, he doesn’t. Visions and experiences take place in consciousness, they have no meaning whatsoever. Before you were born, did you know anything about this world? When you die, will you know anything about this world? You didn’t know you existed — you exist as the Absolute, but you aren’t aware of your existence. When this consciousness comes, spontaneously you know “I am”. You grab a body and become identified with that. He wants you to go back, back, away from this into your true nature. Right now it’s consciousness: the longer we abide in that consciousness only and observe it, we see that everything we see is not ours – there’s a “you” seeing this. Without “me”, there’s no God. Yes. Was there a God before you were? Without you is there a God? There’s no “we”, there’s no entity; there’s universal consciousness which is continually expressing itself through these bodies. They will talk to you on this level if this is your level. But if you understand what I’m saying: there’s only universal consciousness expressing itself, there’s no individual, then he will bring you there. He will no longer speak of this. If you die with concepts these concepts take another form; but they will not be you — you don’t know what that form will be. Concepts will come again and again until they are exhausted. On their level it’s good. But his teaching is that there are no others, no individual entities: everything happens spontaneously, there’s no doer. He teaches: Let this life live itself and understand you are not this. If we aren’t “this”, we are “that”. What is “that”? Consciousness is continually renewing itself. You throw a piece of food into a corner, within a few days worms will come — life, consciousness. The same consciousness in that worm is in you. It’s not “my” consciousness, “your” consciousness; it’s one universal consciousness, and that universal consciousness is you. The first day I came to Maharaj he said: My beingness is a product of food… and the same consciousness in the donkey was in Sri Krishna. I went to get a reservation back home; none was available, so as something inside knew this was true, I went back. He had jerked the rug from under my feet and he kept on doing this until I lost any place to put my feet. He forces you to let go of all concepts. Often. He never knows why, though. Every moment watching him is like a spectacular movie: every person’s need is taken care of — I’ve watched that happen. You can sit quietly but questions you have inside will be answered. Everything happens according to your need. There’s no him, he has no pose of his own… that’s why this can happen. There’s no ego there to bump against. There are no words for it; everything is taken care of automatically. There’s no “you” to thank God for anything anymore. You let go of everything. There’s no you, no separate entity, everything is happening spontaneously. It’s like there’s quiet space where you are yet everything is happening round you. We as human beings think there’s a reason for everything; there are no reasons, no causes — it’s a causeless happening. As long as we are on this human level and think there’s a cause we will be able to come up with one. If some people are taken for a ride by false gurus, you can say this is happening to them to get rid of something — whatever happens is perfect. We are just to understand there’s no personal consciousness, everything is impersonal, you see. But when we meet a perfect teacher it’s our consciousness which recognizes that, surely? To round off, could you say what are the benefits gained from coming into contact with your guru? I’ve gotten rid of the idea that there’s somebody going to benefit from something… (much hearty laughter). But let’s now have more coffee, right? Jean Dunn's two books on her guru and his teachings, “Seeds of Consciousness” and “Prior to Consciousness”, were published by Acorn Press. She was a dedicated chain smoker (as was Nisargadatta Maharaj) and she suffered from emphasema. She died in the mid-nineties. Webmaster Note: Jean Dunn actually put out three excellent books... Seeds of Consciousness, Consciousness and the Absolute and Prior to Consciousness. Edji reads from Prior to Consciousness... and explains it... during his online Satsangs. 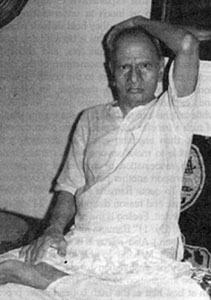 Nisargadatta Maharaj, during his last days (which followed shortly after this unplanned meeting) became extremely weak, consumed by cancer of the throat. He was still able to see people as his spirit was indomitable until the end. He continued to talk and teach with inherent authority although weak in voice. Whatever he said was seminal in nature and a catalyst for his listeners. He had to be brief but whatever came out was now as if voiced from the Great Beyond, not spoken by a frail old man in the clutches of death. He finally left his physical body in September 1981 at the age of 84.